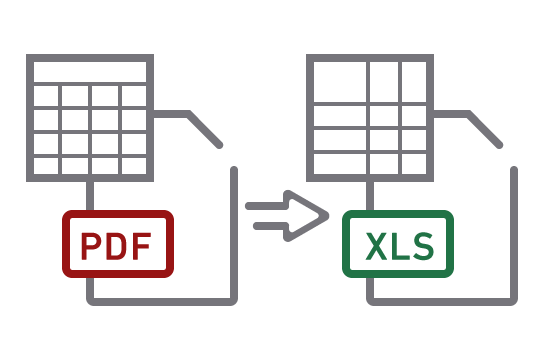 Custom PDF to Excel is Able2Extract’s most distinctive feature that allows you to save hours of time spent on re-formatting converted spreadsheet data. The software comes with the custom conversion panel that lets you manually control how your tabular data is converted. Designate spreadsheet rows and columns, add or delete tables, adjust headers and footers, re-plot tables and manage named table structures. Able2Extract also allows you to preview the spreadsheet results prior to conversion. The overall result? Perfectly formatted Excel spreadsheets every time! Open a PDF file in Able2Extract. Select what to convert: All or Area (part of the PDF). Click on the Excel icon. Click on the Convert button for automatic PDF to Excel. Save your converted file by clicking on the Save button. The fastest way to convert the whole PDF file to Excel. Convert only a part of PDF table to Excel spreadsheet. Convert a PDF table excluding surrounding content. If you are trying to solve the same PDF problems, join them now!